It should surprise no-one that Apple is poised for a huge growth in China. It’s the 1.3 billion people market, folks. Yes, Apple had been neglecting China for years. 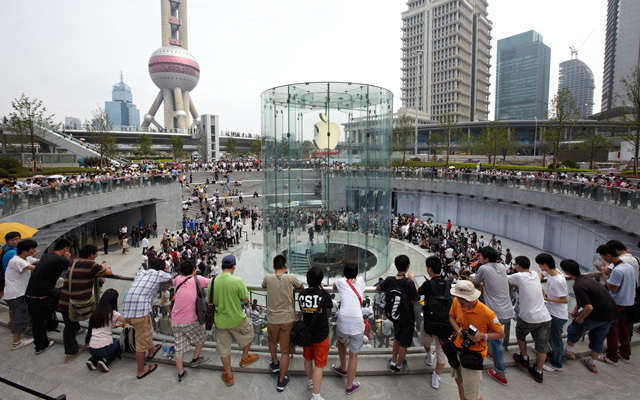 That changed when iPhone came along, providing Apple with financially sound incentives to launch retail operations in China, including the latest spectacular glass tower in Shaghai’s Pudong district. A recent Alphawise/Morgan Stanley survey tells us that the iPhone tops the China’s desirability charts when it comes to 3G-enabled smartphones, with 53 percent respondents saying they would buy the handset if price were no issue. Although high price, gray market and limited carrier availability are being consistently singled out as the biggest contributors to slow iPhone sales in the country, there’s no doubt that even a modest uptick in such a big market would significantly impact revenues. It’s big money out there waiting to be collected, some people think. I suspect the majority of sales came from just the 4 Apple-owned stores. If that’s true, it would be astounding: 4 stores accounting for at least $1.3 billion in sales in the quarter. That would mean each store is on a $1.3 billion annual revenue run rate. A couple of years ago, across its Western stores, Apple was averaging $30 million per year per store in revenues. That figure is not without merit, but that’s peanuts compared to the projected $32 billion annually when additional 25 stores open for business. Mind you, that’s nearly half the company’s 2010 annual revenue of $76 billion. Apple’s iPhone business will also benefit when Foxconn-owned Cybermart retailer opens about 500 stores in the future, up from 34 locations today, each with an Apple Ship store-within-a-store.